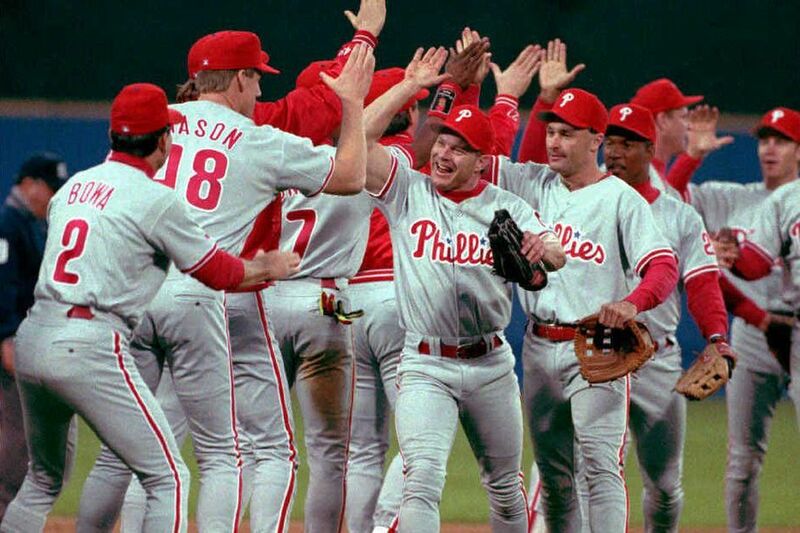 Lenny Dykstra is the center of attention as the Phillies celebrate a win in Game 5 of the 1993 NLCS. As the Phillies celebrate the 25th anniversary of a team with a knack for late-inning comebacks, their game-saving defensive miracles and a chip-on-the-shoulder intensity, we look back at the crew that offers a sobering lesson on the ruthlessness of time. The 1993 Phillies' listening tastes leaned toward hard-rock Whitesnake so it's doubtful many were familiar with a classic Broadway musical whose plot, perhaps better than more-logical rationales, explains the wildly implausible summer when they delighted a city that recognized itself in them. In Damn Yankees, Joe Boyd, a long-suffering Washington Senators fan, makes a deal with the devil, surrendering his soul to guarantee a pennant for the perennial American League doormats. A quarter-century later, the improbable National League title won by the '93 Phillies, a collection of mulleted misfits who finished last in 1992 and would revert to sub-.500 existence in 1994, seems no less a Faustian bargain. Whatever the reason, their magic expired with heartless abruptness at precisely 11:37 p.m. on Oct. 23, 1993, as Joe Carter's World Series-winning home run cleared the Skydome's left-field wall. If that was the start of some cruel Satanic payback, its balance remains outstanding. The slew of troubles that subsequently befell those blue-collar Phillies commenced while Carter was still being mobbed by victorious Blue Jays teammates. Exiting the field, Lenny Dykstra paused to insult Mitch Williams, the erratic closer who surrendered the historic homer. Curt Schilling soon joined the intramural sniping. Later, countless hardships would be piled atop those hard feelings. The best of the '93 Phillies would be tainted by legal, personal, financial, or drug problems. And death would prematurely claim the team's core of leaders. A look back at the 1993 Phillies on this 25th anniversary of their wondrous journey summons more than nostalgia for their late-inning comebacks, their game-saving defensive miracles, their chip-on-the-shoulder intensity and screwball antics. It also offers a sobering lesson on the ruthlessness of time, the transience of popularity, the frailty of heroes. "The '93 team was a lot like the colorful A's teams of … 1929-31," said Bill Kashatus, a local historian who has written books on both, the most recent 2017's Macho Row: The '93 Phillies and Baseball's Unwritten Code. "The colorfulness was a reflection of the protracted adolescence from which all those players suffered. They never grew up and when they retired it caught up with them." When the Phillies celebrated the 1993 team at Citizens Bank Park in June, they held a moment of silence for the members of that squad who have passed. The wild and wooly '93 Phillies' trouble-marred postscript contrasts so starkly with the lighthearted atmosphere that surrounded them that it's as if a Marx Brothers movie suddenly morphed into an Ingmar Bergman film. Because of that, it probably wasn't surprising that their recent 25th-anniversary reunion weekend turned out to be a letdown. Only a small portion of the announced 31,175 Citizens Bank Park spectators were in their seats at the start of the June 10 ceremony honoring the team that once set Philadelphia attendance records. As enthusiastic public-address announcer Dan Baker tried to animate the small gathering, the aging '93 Phillies emerged one-by-one from a tunnel, glanced into broad swaths of empty blue seats, and lined up along the third-base line. The cheers were polite, but not what anyone who remembered the clamor of 1993 might have expected. "It was disappointing," said Larry Bowa, the '93 team's third-base coach. "I thought [fans] related to that team a lot more. I don't think the guys were annoyed, but they definitely felt like it should have been a better turnout." Afterward, the old Phillies retreated to a ballpark suite where, amid beer-fueled reminiscing, they tried to sort it all out. Some of the 20 returning players and assorted team personnel wondered what had changed. Where were the fans? Where was the love? There were practical reasons, of course, for their lukewarm reception. Attendance is down throughout baseball. The Super Bowl-champion Eagles sucked most of the air out of the city's sports atmosphere. And many of the '93 Phillies' best-known figures were either absent or deceased — manager Jim Fregosi, bench coach John Vukovich, pitching coach Johnny Podres, first-base coach Mel Roberts, Darren Daulton, Juan Bell, Dykstra, Williams, Pete Incaviglia, Mariano Duncan, Terry Mulholland. "That's the bittersweet part," said Bowa. "You get to see the guys and that's sweet. But what's bitter is that so many of the guys that were instrumental in this weren't there to celebrate." Kashatus also pointed out that, perhaps because of things like Dykstra's subsequent criminal troubles and Schilling's outspoken political incorrectness, the Phillies didn't promote the '93 celebration nearly as vigorously as the August commemoration of the 2008 world champions, an assemblage of Boy Scouts by comparison. "The fact that we were missing guys like Dutch and Fregosi probably made it less special for the fans," said Mickey Morandini, the team's second baseman. In the end, it was as if Doug Pederson, Nick Foles, Fletcher Cox, and Malcolm Jenkins were missing from a 2018 Eagles reunion in 2043. "Sometimes when you get together like that after a long time," rightfielder Jim Eisenreich said, "you forget that reality happens in the interim." Mitch Williams high-fives third-base coach Larry Bowa while getting a hug from Curt Schilling after Williams got the save in the Phillies’ Game 4 win over the Braves in the NLCS. The ’93 Phillies surprised nearly everyone in their run to the pennant. The story of the 1993 Phillies is, by now, a part the city's sports mythology. A hard-nosed group of unshaven, underappreciated veterans infused with unselfishness, united by beery postgame debriefings in the trainer's room, and, most significant, motivated by a lack of respect conjured up an unlikely pennant. They got off to a fast start and mesmerized Philadelphia with a series of miraculous victories. Milt Thompson's wall-climbing catch snatched what would have been a game-winning grand slam in San Diego. A night later Morandini's defense saved a game in L.A. They were relentless. One of their 97 victories ended at 4:40 a.m., another took 20 innings. "What really made it magical was being picked to finish last before the season," said Bowa. "You take that personally. It wasn't like we all sat down in spring training, read that and said, 'Hey, we're going to the World Series.' But I think a lot of guys said, 'You know, we might not be a great team, but I guarantee you we're not a last-place team.' That sort of carried over. A lot of those guys played with a chip on their shoulders. That gave them an edge they used all year." That edginess and the team's Everyman personality were catnip to Philadelphia's fans. The '93 Phils drew a then-franchise-record 3.1 million spectators in the regular season, another 375,166 for six postseason games. John Kruk is still with the Phillies — in a different role, of course. "It was a bunch of gritty guys who had been searching for a place to play, a dirtball team that had a lot of fun," said Jeff Manto, a Bristol native who shuttled between the big-league team and triple A that season. "People loved them. When I walk around town, people still stop me and say, 'Oh, you were on that '93 team. Man, you guys were crazy.' "
No roster, of course, is immune from trouble and tragedy. Most of the Phillies have led happy, normal lives. Backup outfielder Ruben Amaro Jr. became the Phils' general manager. Morandini was a coach in the organization and now works in its community-relations department. Dave Hollins is a Phillies scout. John Kruk, Larry Andersen, and Kevin Stocker are part of their broadcast crew. Tommy Greene does Phillies postgame analysis. Thompson is a minor-league instructor for the world-champion Astros. Eisenreich sells real estate in Kansas City and watches his boys play baseball. But for several, even before the Skydome clock struck midnight in Game 6's wake, the years afterward have been unusually difficult. Two members of a team known for its looniness would be accused of being crazy. One would have several teeth knocked out in prison. Two more would lose prestigious broadcasting jobs under unsavory circumstances. Several would get divorced. There would be lawsuits, social-media firestorms, claims of drug abuse and illegal gambling. One of them would die at 49, another at 55. "The trouble really goes all the way back to when Dykstra was jogging in from the outfield after Joe Carter's home run," said Kashatus. "He passed Mitch Williams and said, 'I guess there ain't going to be a Game 7.' That started it." Within days of that season's end, Williams went public with complaints about the way Schilling had draped a towel over his head in the dugout. Schilling responded in kind and by December the "Wild Thing" had been traded. But the animosity hasn't subsided. As recently as 2015, at a Philadelphia sports roast, the former closer and Dykstra engaged in an obscene shouting match, with Williams claiming the centerfielder had cheated his son and mother out of money and Dykstra labeling the pitcher a "selfish baby." Despite all the goodwill the defending NL champs carried into 1994, that strike-shortened season would be cruel. In spring training, Kruk got a diagnosis of testicular cancer. He returned quickly, but injuries hampered Hollins, Daulton, and several pitchers. The Phils reverted to '92 form, finishing fourth with a 54-61 record. They'd fail to win 70 games in each of the following three seasons as well, by which time most of the '93 team was gone. Darren Daulton’s presence in the Phillies clubhouse was an important part of the team chemistry. “He kept that team together,” said Mickey Morandini, the second baseman. Among the saddest second acts was Daulton's. The hard-nosed, handsome catcher had been the catalyst in 1993, a veteran player who produced big numbers, policed the clubhouse, and commanded respect on and off the field. When before that season, general manager Lee Thomas imported veterans like Incavigila, Eisenreich and Danny Jackson, Daulton made sure they fell into his orbit. He did the same when the rookie Stocker arrived to fill a gap at shortstop. The resulting chemistry, epitomized by long, analytical, postgame gabfests in the trainer's room, became the under-talented club's strength. "I think that no matter who we would have brought in, with Darren Daulton in that clubhouse, the clubhouse chemistry was going to be good," said Morandini. "He kept that team together." Daulton would finally win a World Series in 1997 after a trade to the Marlins, but an assortment of problems haunted his retirement. There would be a messy second divorce, car accidents, arrests for DUI and speeding, occasional estrangement from his children and, most bizarre, an obsession with subjects like spiritualism, the Mayan calendar, and time travel. He also admitted to drug use, which confirmed rumors about steroids and amphetamines that long had hovered over the famously bulked-up '93 team. "There's probably no one in any sport that has taken more drugs than I have," Daulton said in 2009. Four years later Daulton's virulent brain cancer was diagnosed. Though the disease would kill him in 2017, it oddly seemed to bring some peace and equilibrium to his final years. Jim Fregosi argues a pitch in August 1993. The Phillies manager died in 2014 after suffering a stroke — just another sad chapter in the 1993 Phillies’ legacy. Daulton's death at 55 wasn't the first on the '93 roster. In one grim 10-month stretch from March 2007 to January 2008, three of Fregosi's assistants died — Vukovich, Roberts, and Podres. Then, in 2014, the crusty manager himself died at 70, shortly after suffering a stroke on a cruise. A 2007 congressional probe confirmed what many believed, that Dykstra, the team's MVP, had used steroids. Todd Pratt, a backup catcher, was also named. By then, the prosperous life the feisty centerfielder had created for himself was disintegrating. "Unfortunately for Lenny, he's still struggling. He's battling," Schilling told reporters last month. "It's unfortunate, but it's more proof that we're really not different than anybody else." "It's tough not to have everybody here," Schilling said. "It's tough not to have Dutch [Daulton] and the coaches. Life moves at a very unique pace when you look back on it." Dykstra's fall would include a financial collapse, lawsuits, a divorce, public squabbles with a brother and his mother. He would admit to being addicted to painkillers while a Phillie and to paying investigators to seek dirt on umpires. A housekeeper accused him of sexual assault. A longtime associate alleged that the leadoff hitter bet on Phillies games. He was arrested in 2011 and a year later sentenced to three years in prison for grand-theft auto and providing a false financial report. Released in 2013 after 6 ½ months in prison, he was arrested again this year for allegedly threatening an Uber driver. Dykstra, who couldn't be reached for this article, also has been a regular and sometimes disturbing presence on Twitter and Facebook, occasionally posting obscenity-laced videos of his travels and often-bizarre misadventures. "It's sad," said Morandini, "but something's not right upstairs with Lenny." Schilling, meanwhile, attended the June reunion and was one of the few players there who made himself available to the media, a development that surprised no one. That attendance, though, didn't imply a trouble-free life. Curt Schilling, 1993 NLCS MVP, fell into troubles of his own. Years after becoming a World Series hero with Boston, he lost his analyst job after firing off controversial tweets. "We all know Shill's made himself pretty controversial," said Eisenreich. "But it was still good to have him there at the reunion." Schilling became a postseason hero in Boston, leading the Red Sox to their first World Series win in 87 years in 2004. But in 2010, his video-game company, 38 Studios LLC, collapsed, leaving considerable debt and a damaged reputation. Rhode Island claimed he owed the state $75 million. In 2016 Schilling, who declined an interview request, agreed to pay the state $2.5 million to settle the dispute. The pitcher suffered a heart attack at age 44 in 2011 and was found to have mouth cancer in 2014. Like teammate Kruk, he was briefly a prominent baseball analyst with ESPN. But Schilling, an outspoken proponent of far-right causes, lost that job after a controversial tweet on the issue of transgender bathrooms. Always eager to mix it up with liberals and feminists on social media, Schilling hasn't retreated from controversy. He now hosts an online talk show for Breitbart News, an incendiary far-right information outlet. Williams, meanwhile, never recaptured the magic and was out of baseball in 1997. He coached briefly with an independent league team in Atlantic City. Then like Schilling, his nemesis, he too lost a lucrative television job. He was fired as an MLB Network analyst in 2014 after a Deadspin report indicated, among other things, that he'd ordered a pitcher on his 10-year-old son's baseball team to throw at another player. Williams denied the charges, sued the MLB Network, and eventually won a $1.5 million settlement. Since then he has stayed in the shadows, staying away from the June reunion for a team that once surprised almost everyone but itself. "That was the magic of it," said Manto. "I never had the sense that this would be a World Series team. But I did have the sense that they were going to have a lot of fun. Along the way they won a lot of games. And as the summer went on, things got magical." They stayed that way until, perhaps with a little devilish assistance, Carter connected with Williams' down-and-in slider. And, in the cinematic instant that followed, the feel-good comedy that was the '93 Phillies' story suddenly became a tragedy.